The first time I gave the boys a kale smoothie they looked at me like I was crazy. It was 2008 and let's just say we were new passengers on the "eating better" train. Elijah outright screamed "no!" and ran from the kitchen. Even though Jason was curious, he also refused, and Brandon reached for the cow's milk beside the blender instead. Things are a lot better these days. Even though kale isn't their favorite vegetable in the world, they no longer give me hassle about drinking/eating it. *Choose your fruit wisely- Pineapple & bananas are my go-to kale smoothie fruits because they're super sweet and tend to be inexpensive. Also, they do an excellent job of reducing the bitter flavor that raw kale has. I like to make sure the fruit is frozen to make it more appealing. *Less kale/more pineapple. Don't feel like you have to fill your blender to the rim with kale. Start off by adding a little kale to each smoothie, then gradually increase each time. *Let them help-I never forced the boys to drink green smoothies but having them help me naturally led to *tasting* it. Bonus tip: One of my Youtube viewers suggested using a cup opposed to a glass when serving green smoothies to younger children. Since it's sweet, they may not care about the color once they start drinking it. In conclusion: Green smoothies are an acquired taste for kids. Don't be afraid to add a little agave nectar or use spinach instead of kale. Spinach is an excellent choice because (unlike kale) it isn't bitter and you mostly just taste fruit. Watch me make a kale salad & kale smoothie with Jason below. 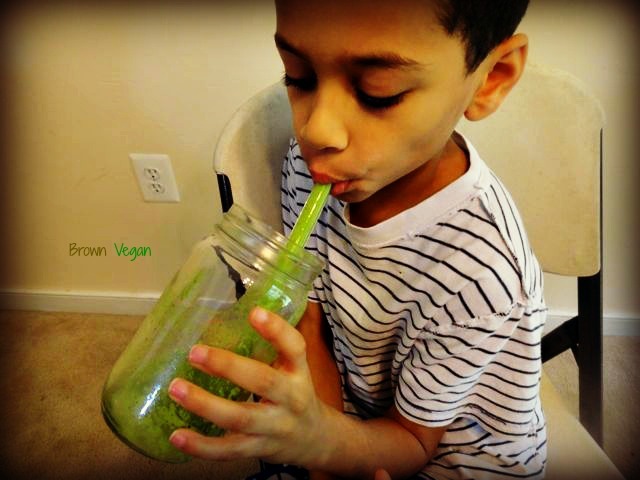 How do you get your kids to drink green smoothies?